Philip Noel-Baker was born on 1st November, 1889. His father, Joseph Allen Baker, was a Quaker who ran a successful machine manufacturing form. Baker, a pacifist, was a member of the London County Council (1895-1907) and the House of Commons (1905-1918). After graduating from King's College, Cambridge, he continued his education in Paris and Munich and in 1914 was appointed vice-principal of Ruskin College in Oxford. On the outbreak of the First World War he became the commandant of the Friends' Ambulance Unit and served on the Western Front (1914-15) and in Italy (1915-18). In 1918 Noel-Baker became principal assistant to Robert Cecil on the committee which drafted the League of Nations Covenant. After its formation he was a member of the Secretariat of the League as served as principal assistant to Sir Eric Drummond, the secretary-general of the League. Noel-Baker was fluent in seven languages. He was also an exceptional athlete and was captain of the British team in the 1920 Olympic Games in Antwerp and won the silver medal in the 1,500 metres. In 1924 Noel-Baker became professor for international relations at London University. He held the post until 1929 when he was appointed as a member of the British delegation to the Assembly of the League of Nations. During this period Noel-Baker wrote several books including The League of Nations at Work (1926), Disarmament (1926) and Disarmament and the Coolidge Conference (1927). Noel-Baker, a member of the Labour Party, was elected to the House of Commons in 1929. He was a member of the National Executive of the Labour Party and took a keen interest in foreign policy. In 1936 the Conservative government feared the spread of communism from the Soviet Union to the rest of Europe. Stanley Baldwin, the British prime minister, shared this concern and was fairly sympathetic to the military uprising in Spain against the left-wing Popular Front government. Leon Blum, the prime minister of the Popular Front government in France, initially agreed to send aircraft and artillery to help the Republican Army in Spain. However, after coming under pressure from Stanley Baldwin and Anthony Eden in Britain, and more right-wing members of his own cabinet, he changed his mind. In the House of Commons on 29th October 1936, Philip Noel-Baker, Clement Attlee and Arthur Greenwood argued against the government policy of Non-Intervention. As Noel-Baker pointed out: "We protest with all our power against the sham, the hypocritical sham, that it now appears to be." During the Second World War he joined the government as parliamentary secretary to the Master of War Transport. In 1944 Noel-Baker was placed in charge of British preparatory work for the United Nations and the following year helped to draft the Charter of the UN at San Francisco. In 1946 Noel-Baker was a member of the British delegation. In the government led by Clement Attlee Noel-Baker served as Minister of State in the Foreign Office (1945-1946), Secretary of State for Air (1946-1947), Secretary of State for Commonwealth Relations (1947-1950) and Minister of Fuel and Power (1950-51). After the Labour Party lost the 1951 General Election Noel-Baker became a member of the shadow cabinet. He also published his books, The Arms Race: A Programme for World Disarmament (1958). The following year he won the Nobel Peace Prize. In 1960 Noel-Baker was appointed as president of the International Council on Sport and Physical Recreation of UNESCO. Other books by Noel-Baker include The Arms Race (1960), The Private Manufacture of Armaments (1975)Disarm or Die (1978) and The First World Disarmament Conference (1979). Philip Noel-Baker died in London on 8th October, 1982. When this information was discussed by the British Labour Movement Conference on the same afternoon there was general support for the continuation of Non-Intervention so long as it could be made more effective. This was the attitude of Attlee, Grenfell and Noel-Baker, another leading critic at Edinburgh, who argued that Non-Intervention was "the right policy provided it was equally applied". Citrine said that there was no alternative to Non-Intervention that could "really materialise for the benefit of the Spanish people". He perceived the question of `volunteers' as one area where Non-Intervention had not been applied and had worked, at least in numerical terms, against the Spanish government. Finally, he believed that they should not create the false impression at the conference that they had the potential to supply British arms to Spain - under no circumstances could they "get the people of this country to go to war about Spain". Therefore, all of their efforts should concentrate on making Non-Intervention "as complete and strong as possible". Bevin continued in this vein, arguing that they had to tell the Spanish "the truth about our position here and (tell them) their only salvation was to get absolute unity to face Franco in Spain". He also suggested that the Labour Party should concentrate its future attacks on the German threat to British financial interests in the Rio Tinto mines. 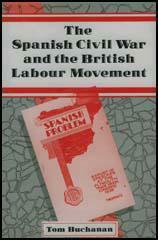 He concluded with a four-point programme which was duly accepted as British policy for the conference.